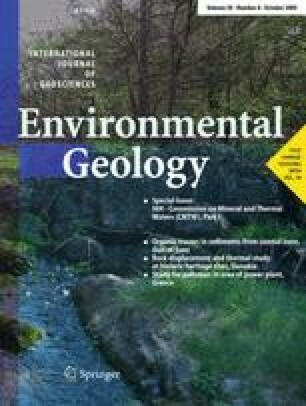 A methodology is presented for evaluating and mapping the degree of groundwater contamination by applying the contamination index C d . The applicability of the contamination index was tested in two distinctly different geological regions: the area between Uusikaupunki and Yläne in southwestern Finland and the Brezno area in central Slovakia. The index takes into account both the number of parameters that exceed the upper permissible concentrations of contaminants or potentially harmful elements and the part of the concentrations exceeding those values. The water-quality parameters reflect the effect of diverse natural (topographical, climatical, geological, biological) and anthropogenic (type of land use, local pollution) environmental factors on groundwater quality. In Finland, technical-aesthetic contamination was found over more than half the test area. These quality problems were most often related to acidity and high concentrations of organic carbon and Al and Fe in wells. Health-risk-based contamination, mainly caused by elevated concentrations of fluoride, radon, or nitrate, was found in only a few separate areas. In Slovakia, naturally contaminated and anthropogenically polluted groundwaters could be distinguished. The geogenic pollution is mainly derived from sulfide mineralizations. In both countries the strongest anthropogenic pollution was found in intensively cultivated areas.